Tuper Tario Tros. is millionaire ! We are proud to announce that 2 months after it has been released, Tuper Tario Tros. 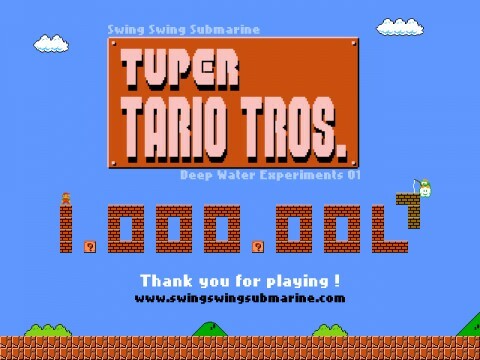 has been played more than 1.000.000 times on Newgrounds. And much more if we count the other websites that featured it (and sometimes “stole” it). Regardless of the exact number, we are happy that so many people played Tuper Tario Tros. and enjoyed it. Some was inspired by the game and created a little flash movie based on TTT and another mash-up between Tetris and Snake. Maybe Tuper Tario Tros. will come back at the end of 2010. Who knows ? That’s impressive guys! But honestly, you really deserve this success. Good luck for your next projects.